What's your favorite song that's got a good beat for walking? I'm looking for new tunes, and I'd appreciate any suggestions in the comments below. Next month I'm walking a half marathon for no particular reason. That's a lot of miles to walk, all at once, for the heck of it, you know? My favorite walking partner got sent on an all-expense paid working trip to an exotic foreign locale, so I'm training with my second-favorite walking partner, Simon. On longer walks (to me right now that's over 4 miles) he slows me down with his endless sniffing and assorted dog-on-walk behaviors. 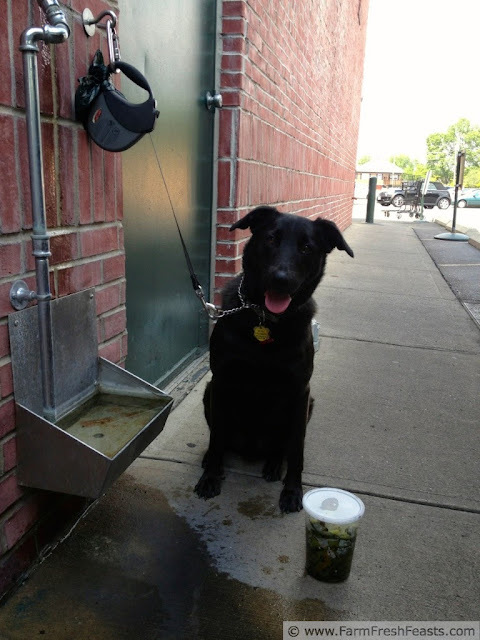 For shorter jaunts (and yes, walking one mile to buy a quart of freshly-roasted Hatch chiles or a gallon of milk is now a short jaunt, and a gallon of milk isn't that heavy when you carry it for a mile) he's a good walking buddy. On one of our walks recently Simon and I came across a plum tree, with ripe fruit spilling out all over the street. 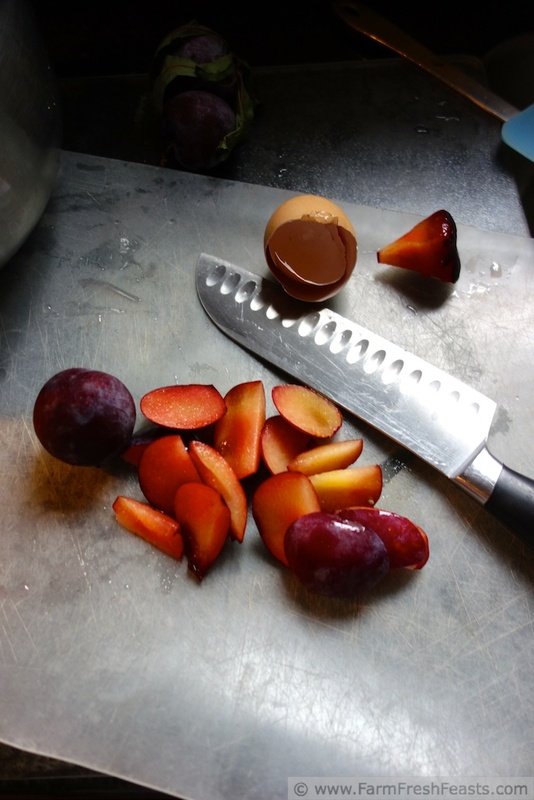 Being a frugal scavenger at heart I snagged a handful of ripe plums. 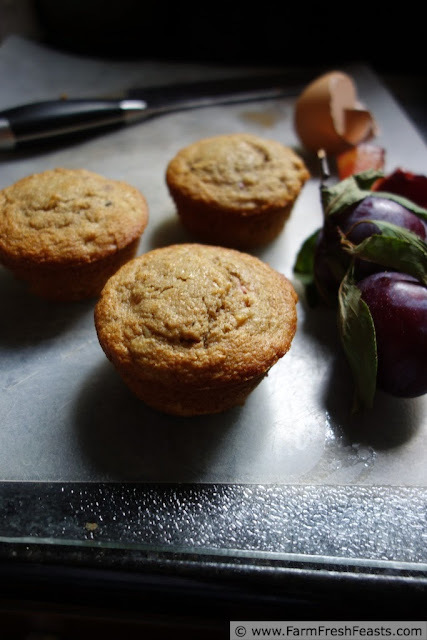 I'd been wanting to try a soaked-oat plum muffin. It wasn't until I arrived home miles later that I realized I didn't have any buttermilk. We were heading out of town though, so I didn't want to buy buttermilk before the trip. Instead, I decided to experiment with some of the whey. If you've wandered past my FB page, you've seen the numerous jars of whey produced when I made mozzarella and ricotta cheese after getting a good deal on milk. I've been playing around with the whey, and this is the first recipe I'll share using whey. I've got oatcakes and pizza dough in the pipeline as well. Whey's a useful thing--that is, if you've got a bunch of whey, don't throw it out, it can be used! These muffins have a slightly crumbly texture if you put the leftovers in a bag and pack it below heavier objects in a car. I'd imagine that most muffins would behave the same in a similar situation, but I thought I should point that out. The evening, or at least an hour, before you'd like to bake, combine oats and whey or buttermilk in a large bowl. Set aside. See NOTE below. When you're ready for muffins, preheat the oven to 400 degrees Fahrenheit and spray a muffin pan with oil spray or line with papers. 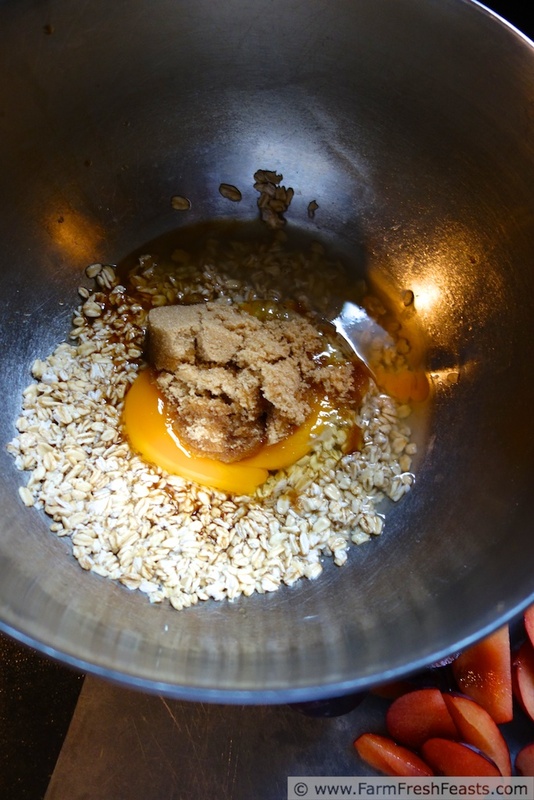 Stir the egg, brown sugar, oil, vanilla and yogurt into the soaked oats. Mix well. Dump the dry ingredients on top, and mix slightly. Add the plums, and stir until just barely combined. You don't want a nice smooth batter here as that will make a flatter muffin--keep it a little lumpy for better lift. Scoop ** (Amazon affiliate link) batter into prepared pan. Bake for 18 minutes, then cool 5 minutes on a rack before removing from the pan. Makes 12 muffins. NOTE: I've updated my Overnight Soaked-Oat Muffin Basic recipe, because I found it's easy to prep several batches of oats and buttermilk at the beginning of the week and store them in the fridge until I'm ready to make muffins. You can see that basic recipe here. This post is shared on the Clever Chicks Blog Hop, Tasty Tuesdays, Wednesday Fresh Foods Link Up, What's Cookin' Wednesday, What's In The Box, and the From the Farm Blog Hop. Looking forward to meeting you and Simon! I'm looking forward to it as well, though Simon could be nervous at first. He warms up. Hey! So I’ve got ripe plums, a TON of whey -- and a dog who looks just like Simon! It's always that way, right? No one ever has "a pint of whey, I could use a cup for this", you know? Is she a hugger, like Simon? He's always happy to meet a fellow hugging dog, but dogs who do not like to hug are often . . . put off by his exuberant greeting. Enjoy using up your whey I mean making muffins! Yet another interesting recipe from you Kirsten. "Whey" to go. Thanks! I was kicking around all sorts of "Whey? No way! Yes, whey!" nonsense for this post, but I opted out. THANK YOU for letting me type it anyway! That could be anywhey . . . I love baking with whey. I have a 1/2-gallon of whole milk waiting for me to make it into ricotta. Now I have a new recipe for the whey. Thanks! What else do you like to do with whey? I played around with two quarts and froze two quarts, but now I've got sourdough starter working and that is occupying my 'how shall I use this in a baked good' creative juices. I use it as the liquid in any yeast bread recipe. It is especially good in my hamburger bun recipe: http://thecookslife.wordpress.com/2013/04/03/homemade-hamburger-buns/. It makes any bread softer than even using milk. You could use it in your sourdough recipes if they call for any extra liquid. I have had a sourdough starter for years now, but I haven't posted any recipes using it. I guess I need to get on that! I've made your hamburger buns, but now I'll make the next batch with whey. Thanks! I like the update, and I actually plan on doing this the next time I have buttermilk or even when in the fridge. More muffins to make. Life is good. There are always more muffins to make. I'm trying to figure out how I could make a fig and goat cheese muffin. I just want to stuff the goat cheese-stuffed figs into my mouth, and then I have nothing for the muffin. They look delicious. I like the idea of soaking the oats, I'll give it a go. Visiting from Tasty Tuesday's. 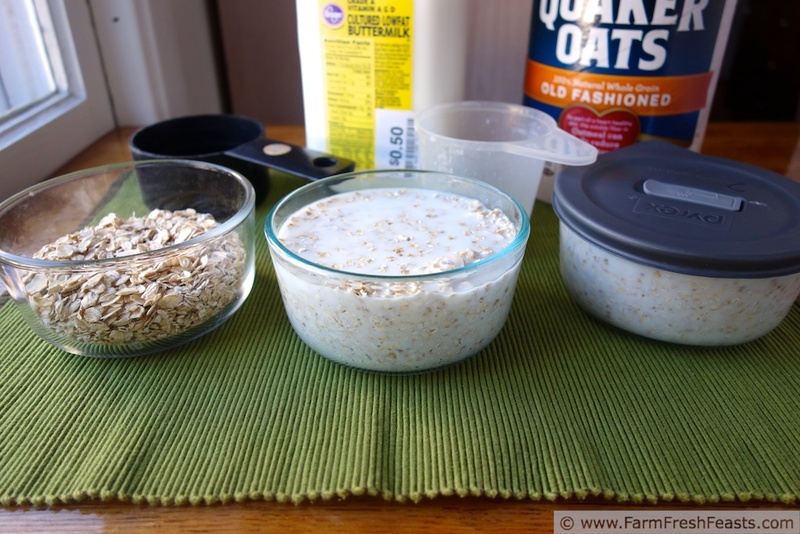 Soaking oats is a really 'low effort-big return' step. It's easy to do and the result is terrific in a variety of recipes (pancakes, waffles, to name two). these look so delicious! and while I don't have tons of whey to use up, I do have fresh plums...yum! Buttermilk will do just fine here, or I suppose lemon juice and regular milk (but I never see marked down lemon juice, like I find marked down buttermilk!). This cracked me up. And I am not sure I have met the person I am so happy to see that I would be happy at 5:30 AM. ;) Pinning the recipe--I don't have whey but I love the idea of buttermilk soaked oats! My walking buddies from Virginia are the kind of people you'd be happy to see that early in the morning. I miss them! If you ever need whey, come on over--I have a couple of quarts put up in the freezer I'd be happy to get taken off my hands!